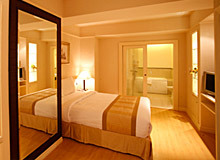 Hope Land Executive Serviced Apartments offer a total of 187 rooms, all elegantly designed to cater for all your needs for your stay in Bangkok. With English, Thai and Japanese speaking staff you will always be serviced as efficiently and as fast as possible. 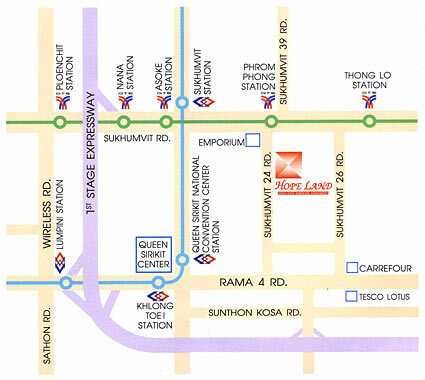 Hope Land is located in the heart of Bangkok's Central Business District on Sukhumvit 24. 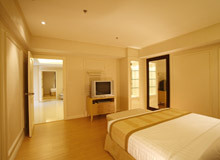 The Studios are single bedroom compact and provide a pantry inside, ranging in size from 40 sq.m. to 45 sq.m. with balcony. The One Bedroom Suites are suitable for a small family, utilities spaces for living and dining with kitchen corner, ranging in size from 50 sq.m. to 65 sq.m. with balcony. 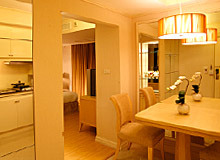 The Two Bedrooms Suites are very unique and elegant units of ranging in size from 85 sq.m. to 112 sq.m. with balcony. Designed with a fully furnished and electric appliances with well-equipped kitchen to make you comfort and convenience for your home. 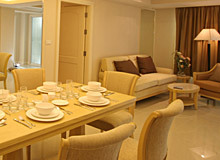 All apartments are available for a short term and long term stay leasing up to 1 year or moreover. Phrom Phrong station allows access to many of Bangkok�s most visited areas and sites such as Siam Paragon Shopping Center which is situated right next to MBK in Siam Square. For night time entertainment there are numerous bars and clubs situated on Sukhumvit Road such as The Robin Hood, and The Londoner's Pub. A short taxi ride can take you to the famous RCA club, Escudo's or Santika which are very popular in Bangkok.